I don’t know what possessed my parents to call me that, but somehow it started and it doesn’t.stop. While they’re better at minimizing the nickname, I still occasionally hear it and want to scratch my eyes out. Really? What kind of nickname is Haystack? It’s not catchy, it’s not cute or endearing, and frankly, just thinking about it gives me an allergic reaction. Here is a picture of me as a child, in all my golden, straw-like glory. Dude, what gives? I know people have far worse nicknames than I (and far greater problems than complaining about a nickname), but come on. It’s totally lame. Why can’t I be something like SugarBear or Princess? On second thought… I hate those, too. As far as I’m concerned, most Hayleys in the world do NOT want to be compared with a large stack of dead grass. It’s confusing, slightly insulting, and makes us want to sneeze. So if you can please refrain from calling any humans haystacks, I know a Hayley in this world who’d appreciate it. 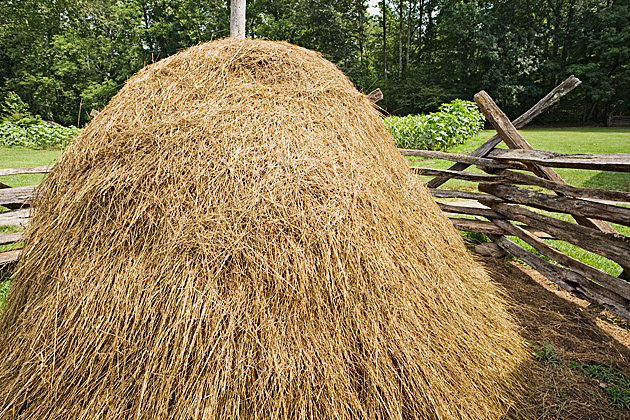 Howeeeeever, I have no problem calling other things haystacks, like actual stacks of hay OR haystack cookies. You know, the ones made with melted chocolate and chow mein noodles? They’re no-bake, a cinch to make, and resemble little stacks or nests. These are no exception and taste loads better than dry grass. No-bake and perfect for fall, these Cornflake Haystacks are filled with butterscotch, candy corn and lots of crispy, gooey yumminess! Line a muffin tin with about 18 paper or foil liners and set aside. Meanwhile, in a large microwaveable bowl, melt together the butterscotch chips, butter, and condensed milk. Stir together and microwave in 30-45 second increments at medium power, stirring after each addition, until the butterscotch chips and butter have completely melted. Stir until blended. Mix in the cornflakes, pecans and candy corn to coat thoroughly. Allow the mixture to cool at room temperature for about 20 minutes. Spoon the mixture evenly into the prepared baking cups, pressing down gently to condense them tightly together. Refrigerate the cookies for at least 4 hours, preferably overnight, before removing from the liners and serving. Combining sweetened condensed milk, butter + butterscotch chips lends a fudgy texture to these crunchy, no-bake cookies. The cornflakes offer a delicious, crispy texture that tastes so good with the salty pecans and the little pockets of sugary candy corn. Consider using flavored candy corn in this recipe to dress it up a notch–here, I used s’mores flavored corn which lent a subtle, smoky/sweet chocolate and marshmallow flavor to the cookies. Likewise, caramel apple flavored corn would be delicious! Have a fantastically delicious day! Ok, I’m totally weird, because I think Haystack is kind of a cute nickname for Hayley – don’t hate me! 😉 I actually don’t like ANY nicknames for my name though, so I can relate to that! These haystacks look awesome! I understand your pain, I used to get called pom-pom because of my bushy hair (now I wear it braided all the time haha). However, I do love no bake desserts and pretty much all the ingredients that go into these haystacks! ANYWAYS, these look awesome, pretty sure I’d eat the entire stack of them right now if they were in front of me. These look like little heavenly crunchy fall bites of goodness! YUM! Umm yes that’s a totally odd nickname and you definitely don’t remind me of a haystack well maybe these fabulous concoctions because you are so sweet! Haha! Hayley if only you knew my nickname. It’s from The Little Mermaid – when Ursula calls the eels her “poor little poopsies.” Well, that was my favorite movie when I was little. I’d watch it every single day. My family, to this day, still calls me poopsie. So you’re not alone in the shameful nickname world! These are so cute! I love this take on haystacks. I’m making my own soon but they’re more traditional–just butterscotch chips and crispy noodles. I got called Nickle all though middle school. Honestly, I feel as if my self worth is worth a little more than a nickle but hey tell that to Middle School Boys. These haysticks look like kickass no bake cookies. I also ADORE haystack cookies and I love how you’ve changed them up with cornflakes!! YUM! Lizard Breath- that was my nickname by my best friends dad and a few other people! Horrid!! I don’t understand it, why can’t we just go by our names! I will be at work introduce myself to a table as Elizabeth and they respond okay beth!? Like are you kidding me I said ELIZABETH!! ARRRRR!!! Anyways let me drown my nickname sorrows in these babes, I don’t think I have ever had a haystack but I’m thinkin I need to change that! Okay. Where did you get those s’mores candy corn???!?!?!?!? !